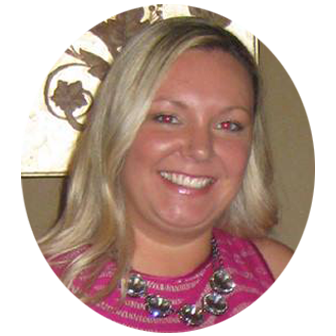 Don’t just dance your first dance to your favorite song! 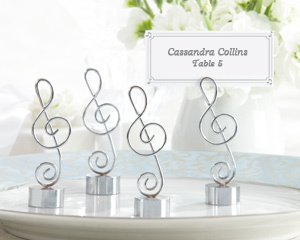 Remind each guest how much in harmony the two of you have become with this lovely Musical Note Place Card Holder and Photo Holder wedding favor. 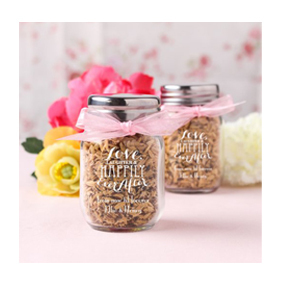 Mini personalized mason jar favors with an imprinted message are pretty and petite. They’re perfect as favors or as décor at any rustic chic bridal shower or wedding! These multifunctional personalized mason jar favors can be used for just about any purpose – as part of a candy buffet, vases for centerpieces, or as holders of small trinkets and mementos to give to your guests. Each jar is glass and comes with your customized printed message and a coordinating screw-top lid. 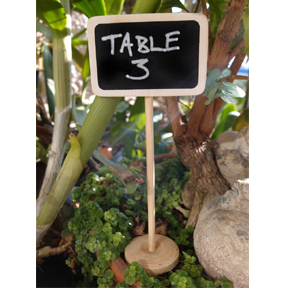 An adorable mini chalkboard table number stand is a great way to add some personal flair to your decorations. 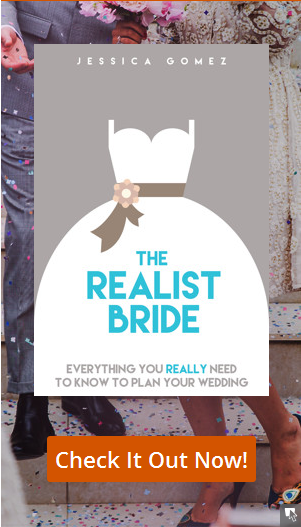 Your sign can be customized for every table at your party, wedding, bridal shower, or any other event! The chalkboard sign allows you to create labels, draw doodles or add personal messages for each spot. 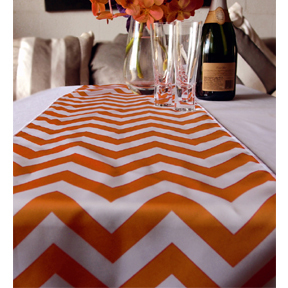 Chevron table runners are a hot wedding trend; it brings a happy and lively setting to any wedding or party. Patterns make sure you aren’t taking yourselves too seriously, but this one is still elegant and modern. This Chevron table runner is stunning in appearance, but won’t break the bank. 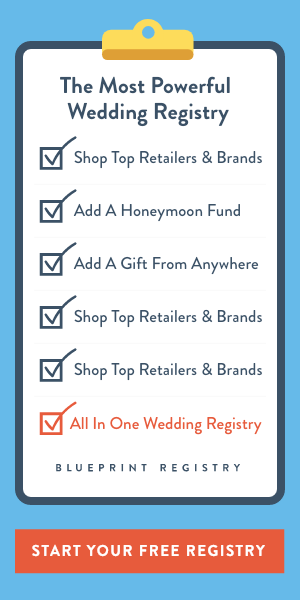 Great for bridal shower table tops, wedding reception tables, and dessert tables. Personalized stemless wine glasses are the perfect favor to toast to love, friendship and wine at your wedding or bridal shower. These wine glasses are a little larger than the usual stemless so that you can eat, drink and be merry well into the night. 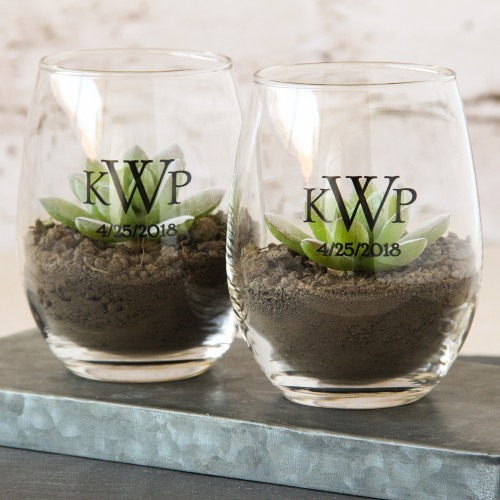 These personalized stemless wine glasses can be customized with pad printing in a variety of designs and colors to reflect your wedding style. 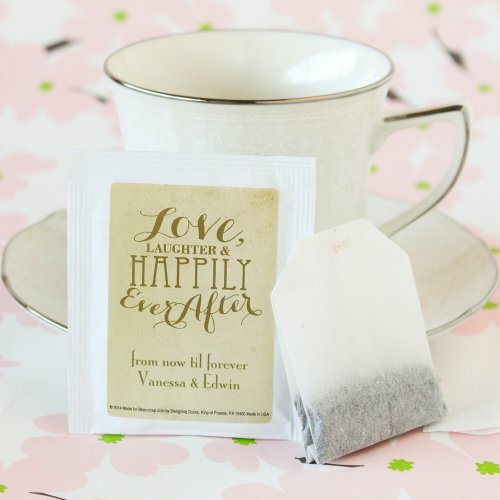 Personalized tea bag favors are a great choice for the sophisticated bride for both wedding and bridal shower favors. For anyone looking to give their guests something unique to remember the happy occasion, our Wedding Tea Collection is the perfect way to say thank you for sharing in your special day. A very chic favor, and the customized message makes it that much better! Our tasteful, personalized tea bag favors gives bridal couples a new alternative to traditional wedding or bridal shower favors!